You have something vital to contribute. There is a message that only you can bring forth. I am here to help you learn to use the medium of internet radio to reach the world. This establishes you as an expert, gives you a platform that allows you to share your information in real time and adds yet another dimension to your brand’s exposure! These are some of the reasons why I chose to build my internet radio network. For years I have enjoyed being part of the “traditional” broadcasting industry, you know, the kind where one simply turns on a radio or television and there you are! Many people I would interact with would tell me how much they wanted the chance to be a part of that world and yet there were only so many jobs, so many chances to work in their own home towns doing something they really wanted to do with their lives. So when I found the world of INTERNET RADIO I was thrilled because here was something people could DO to fulfill their dreams and do it in a way that allowed them to have CONTROL over the broadcasting process. Naturally I started doing my own internet radio program and fell in LOVE with the FREEDOM and EASE of it all and was eventually hired by a company to TRAIN others how to do their own shows and I did this for years with wonderful results. When that company and I parted ways, I decided to continue offering the TRAINING and SUPPORT to those who also wish to CREATE and HOST their own internet radio programs. Yes that means I am a consultant, instructor, and coach for HIRE and yes that means that you and I can work together to get you on the air in no time flat and yes this is for real!! You will learn how to DESIGN/FORMAT your program, DEVELOP hosting skills, PROMOTE your program and yes, you can MAKE MONEY doing all of this! I work with you every step of the way and through our interaction we cultivate your message in a way that represents you authentically ! Contact me TODAY @ perspective_power@yahoo.com and let’s get you on the air. …when I created The Perspectivepower Radio Network years ago on Blog Talk Radio, it was to promote the philosophy of a book I had written called Perspective, it’s all about replacing one thought with another. On this network I was interviewing people from all walks of life so they could share their perspectives. My life took a different direction for a couple years and now I have returned to revive the network and offer a few NEW programming ideas! So I am grateful to share what is going on with the network and do encourage those who want to learn more to CONTACT ME today so we can get you trained and celebrate the launch of your own internet radio network. 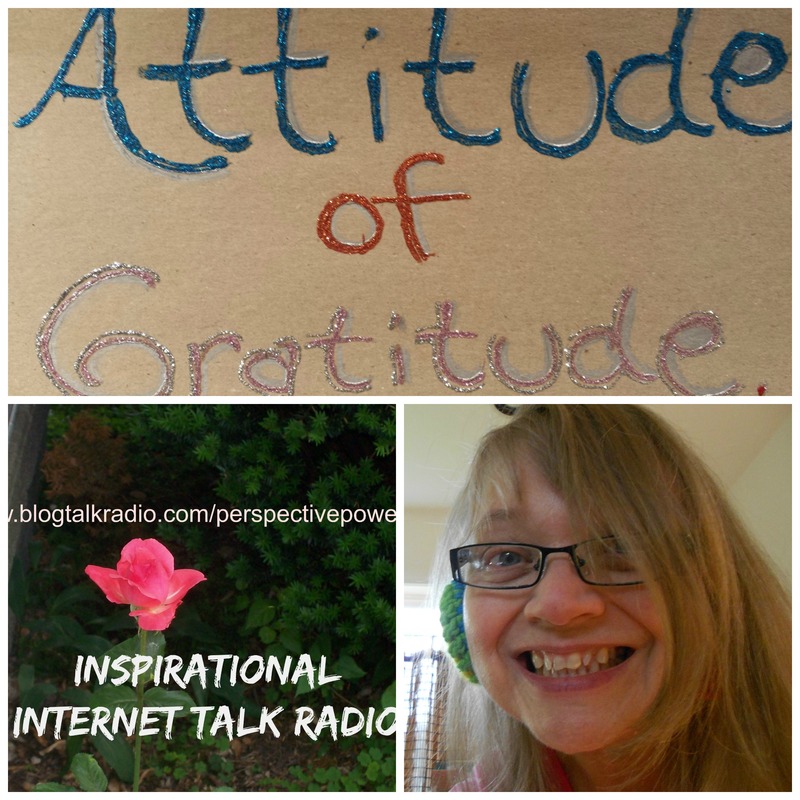 Attitude of Gratitude which is LIVE every Wednesday 8-8:15am ET. This is our time to connect through gratitude, which will always help us create a magnificent life! Follow the link below where you’ll be taken to my host page. While you’re there be sure and click on the ‘Follow’ tab on my host page! You can listen to archived programs too! so happy to have the DONATIONS to keep the network GROWING! thank YOU! Went wading in a mud puddle.. curses! soiled again!! Fun and frolic for all! I’m pouring, so step right up and join my in a cuppa! This really cool, this might be a stupid question but what is the major difference between internet radio and a podcast? Not a stupid question at all. A podcast is something you record and make available as a file, like an MP3, for someone to down load and listen to whenever they like. I use my internet radio station to not only create my podcasts, but to give them an electronic address where people can find them. Also, because each show has one LIVE broadcast, it is a lot of fun. I do the LIVE show, then what is left over is and ARCHIVE that I tend to call a PODCAST for a couple different reasons, not the least of which is because it’s a word people are used to using. Thanks for asking. Oh, and this whole Blog Talk Radio thing is F-R-E-E! Okay, I can definitely see how the live part is a big difference between the two. Do you have different topics based on the radio “show” or is everything on the radio station have a common theme? Everyone’s radio network is different. You would be in charge of yours and you can do a different show everyday if you like. Most people pick and stick with a particular theme because they are using the radio to expand a brand. If that brand is in fact, themselves, then they may stick to a theme such as controversial topics, humor or self-help. One of the things I do, is work with someone to develop their network, from the ground up, then as needed, I continue to work with them on their productions. It’s fun. I believe in the communication power of words, written AND spoken! Thank you sir, take a bow!! Always a pleasure to be party to the party! There’s something so comforting about a plate of cookies just sitting there, waiting to be wolfed down, I mean, enjoyed with the beverage of choice. I really wish it had been 5 full syllables… oh well. Magic Does Exist. It lives in our perspectives and we kill it with our conscience. It’s nice to meet you…I look forward to reading more of your blog. Awesome! Happy to make a new friend!!! Thank you for the nomination, Denise. Most appreciated.